Last night was the best night in the hammock so far. Either I’ve finally figured out how I like to hang (it’s not a straightforward matter, kind of like finding your perfect combination of mattress, duvet and pillows) or I was just shattered from the 14hrs spent on the road yesterday. Either way, 8hrs sleep means I’m waking later than I’d planned but I’m so comfy that I struggle to drag myself out of bed. The Ape decided to hang out in te woods with me last night. Great little spot! I was ridiculously close to Hawes last night, so I decide to head to the Penny Garth Cafe for a New York Breakfast – I’ve been craving some steak for a while now. The food is good, the weather is good and it helps that the girl at the counter is beautiful too! Taking a different route out of Hawes this time, it’s not long before I’m in Cumbria and I realise, I probably could have made it to Kendal if I’d pushed a little harder, but that’s not how I want this trip to be; I’d much rather go with the flow, and last night the flow ended with a perfect hang and a great night’s sleep, so it must be working. 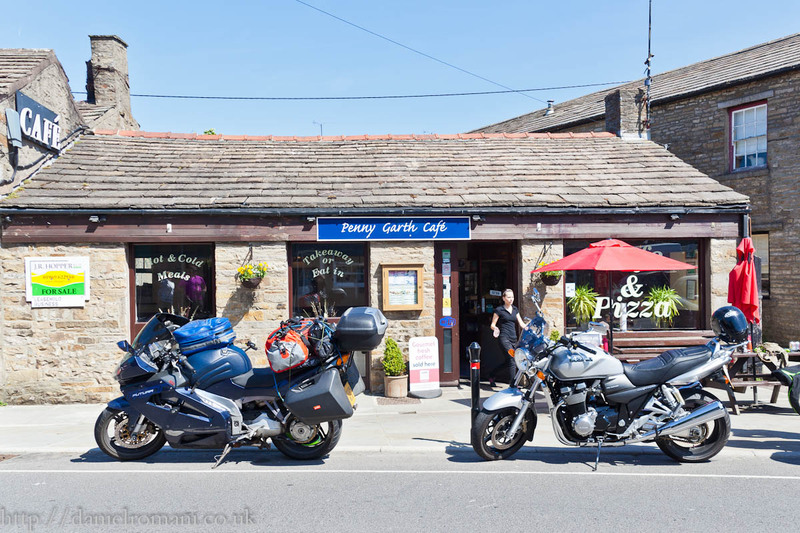 Not many biker’s at Penny Garth Cafe , Hawes, this morning. I spoil myself with a New York breakfast. Mmmm… steak! Cumbrian Roads are similar to the ones I’m used to from Northumberland; narrow lanes, tight corners, and trees providing a foliage canopy. It’s a nice ride actually and I’m taking it easy until the caffeine from breakfast kicks in. Presently I notice a red car in my mirrors, he seems to know the roads better than me and wants to get past – that’s no good, I’ve not been overtaken by a car on this journey so far! I’m not against letting him past but I’m fast approaching a small queue of traffic in any case, so I sharpen my wits, leapfrog the queue and leave them behind. 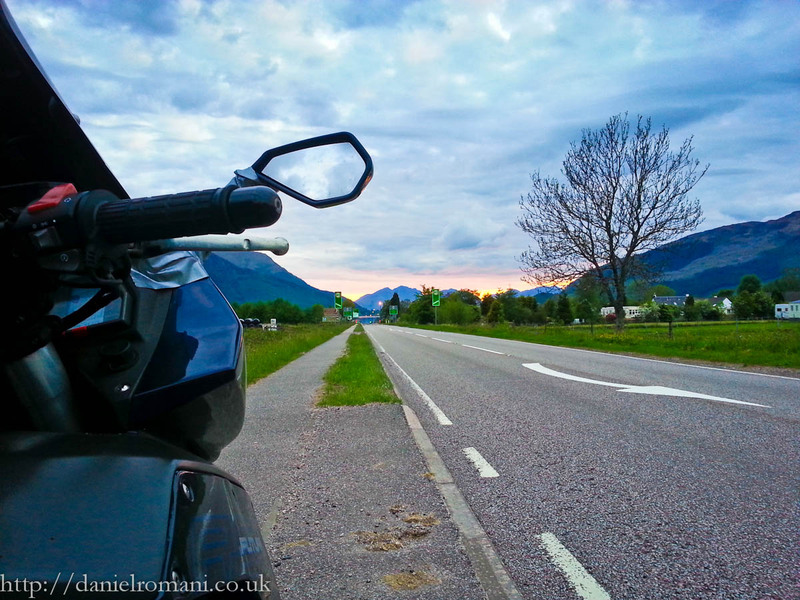 A few minutes later, there’s that red car in my mirrors again, he’s good, must be a biker at heart, ha ha. I probably should let him pass; he clearly knows the roads better and is in more of a rush than me but there’s this HGV up ahead and only one of us will be able to pass it before the next series of bends. Sorry fella, but I think it’s going to be me. Now that I’ve changed direction, the angle of the light is perfect for making pictures, so I find a safe spot to stop and start snapping. I’ve only been at it about 5 minutes when, vrooooOOOoom! There goes that red car! I guess he has the last laugh after all. I’m reminded of the Tortoise and the Hare. 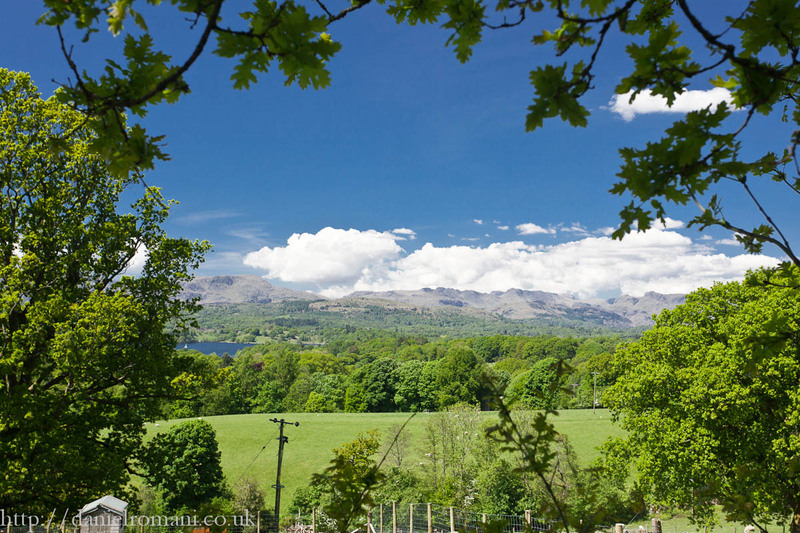 Cumbria is looking pretty lush right now. 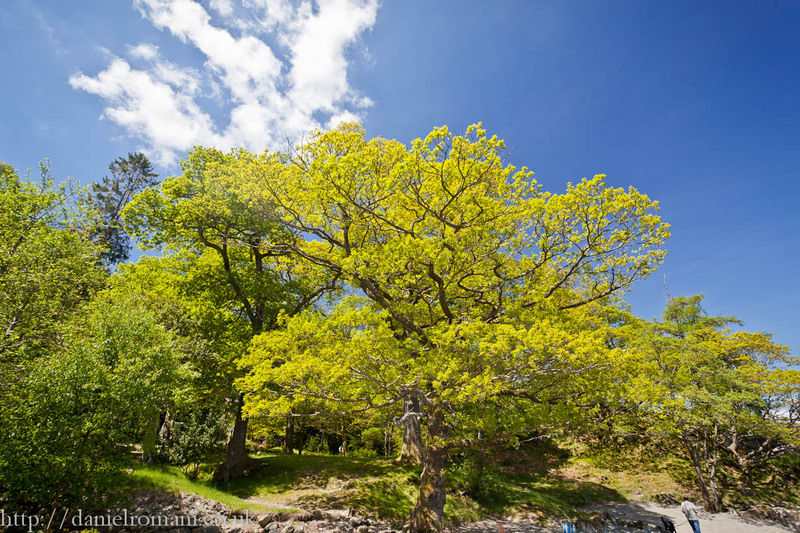 A stand of trees basking in the sunlight. Kendall is calling and I’m there in what feels like no time. 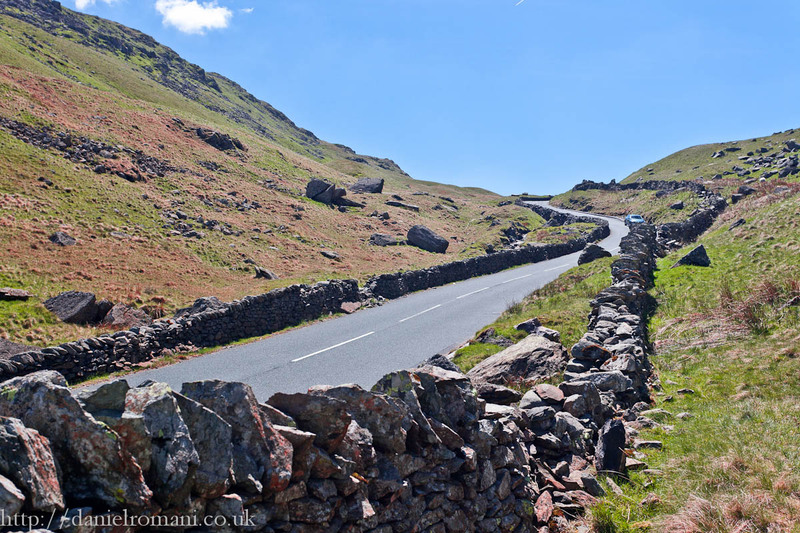 The Lake District is beautiful and I really ought to spend more time here but today I’m thinking about Kirkstone Pass. I’ve never ridden it before, and my Mam had a crash there once, so I’m a little nervous. I stop on the ascent into the pass, to take some more photographs, and then press on. When I get there it’s around lunchtime and the roads are busy. The Pass itself is a really great road, it has some tight twists but the road surface is fantastic. I’m loving being able to watch where the corner is going rather than watch what the road surface is doing! In this direction (North) it’s mostly down hill and the views are simply stunning. 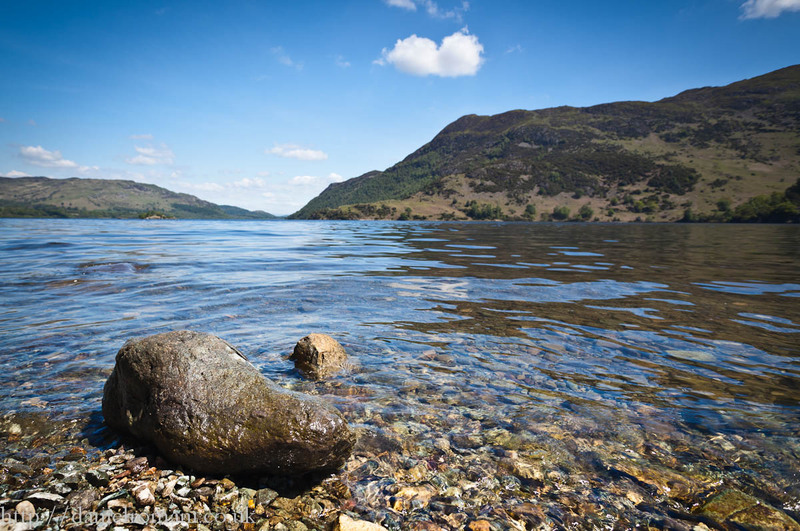 Unlike in Snowdonia, the Lake District National Park, has plenty safe passing places, rest stops and viewing areas – it’s almost as if they know people will want to stop and take pictures (weird that, right, Wales? ): so I do exactly that. I just know today is going to be a slow progress day: I’m going to want to stop for pictures all the time, but I also know that the further North I go, the later it stays light, so I’m hoping to make it all the way up to a friend near Dornie, where I can take a day to catch up on post-writing and picture-editing. I glimpse a view of the Lakes proper before I enter Kirkstone Pass. today is just a flying visit though. Looking South on Kirktone Pass, Lake District. Well worth the detour. I’m in the Lakes, so I’d better photograph a Lake. They’re better than any of those reservoirs from Day 1. The Lake District is easy fodder for pretty pictures! Anyway, back to right now, even though the Fut is still limping along on three legs, I’m able to make smooth progress through the traffic thanks to good road design and good surfaces. The sun is up (still! I can’t believe my luck) and the going is good. Before I know it, I’m peeling off before Penrith and taking the road up toward Alston and Hartside Pass. This is home turf for me and, to be honest, with the possible exception of the roads in Wales, I haven’t found any better roads on the Bike8 (yet). Obviously it helps that I know where the corners are going before I get to them but that’s not why this road is so good. The resurfacing is all finished up here, the tyres grip the tarmac and you can see the road stretched out ahead of you for miles, it’s like a (well policed) racetrack. 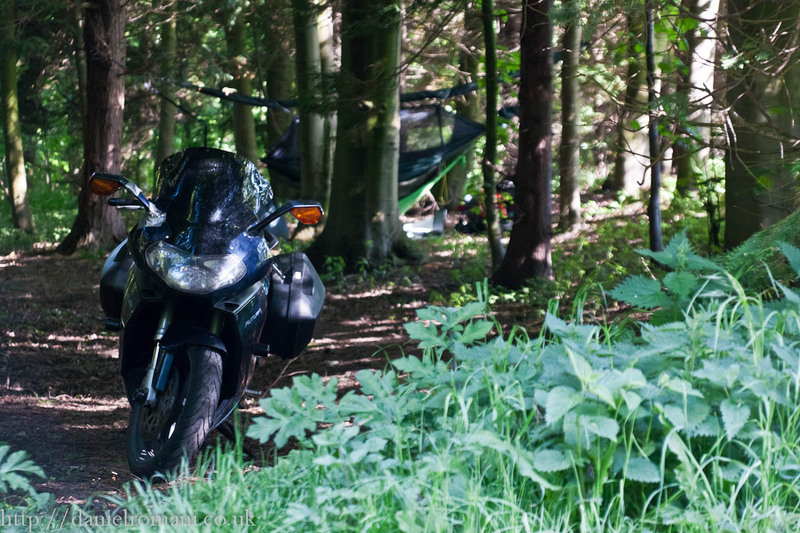 Of course, the nature of riding unfamiliar roads is that potentially great roads seem too challenging and roads that are a ton of fun would probably be boring if you knew them well, so it makes sense that I’m still biased toward my own stomping ground. I have mixed feelings about being so close to home; it’s great to be on roads I already know and love but the temptation to get my sick bike some medicine, and leave the Northern Loop to another time, hangs over me. 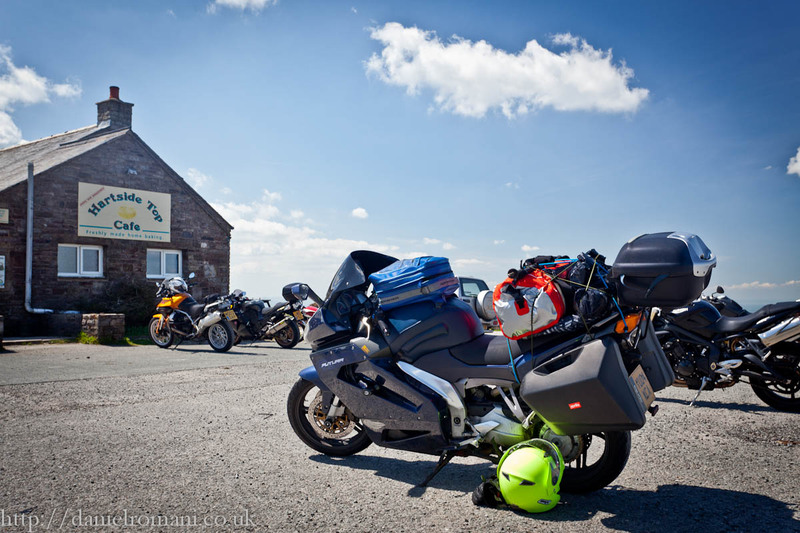 I stop at Hartside Café to think things over and admire the view (it’s obligatory, you know) and I go inside for a slice of some very, very sweet ‘broken biscuit’ cake. I’m served by another gorgeous girl, which can only be a good sign, so I decide to keep going – but if you’ve seen yesterdays spoiler post, you already knew that! Hartside Pass, Alsotn. 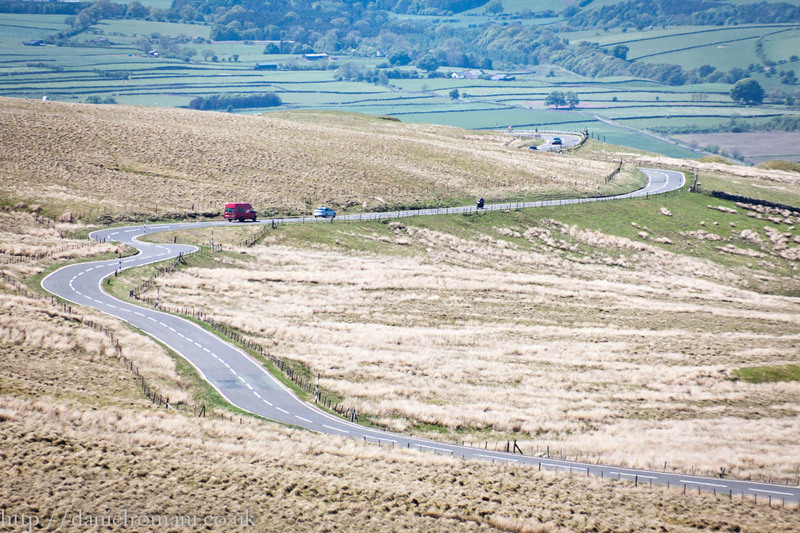 One of the best roads in the UK, if not the best in England. Just before the road hits Alston, the route switches back up roads I didn’t even know about before now, great roads, roads I should have known about, roads that take me into Scotland. There’s a lot of busy A-roads and Motorways to navigate in order to get around Edinburgh and Glasgow. I hit Glasgow right around rush hour and Great Western Road is wall-to-wall cars. I do my best to filter but the split between the lanes is a rough gash in the road and, with this suspension, I’m all over the place, scaring the drivers on either side of me. I’m not one for going backwards, so I figure I’ll just have to use the mobile phone for now and then try and find a way into the box when I get to my friend, Mariella’s place. 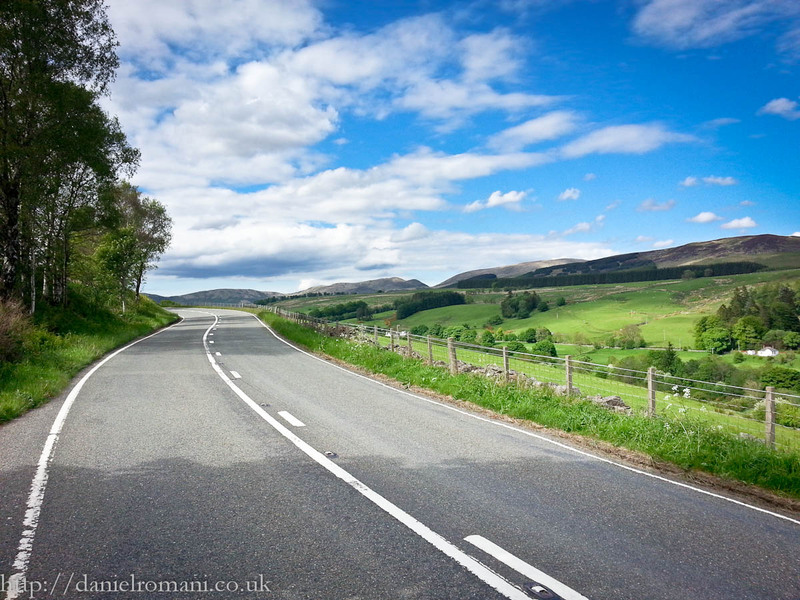 Back roads out of Alston sneak into Scotland without much fanfare (other than the mountains). the roads in Scotland are the best so far. Duke’s Pass – an optional extra – is signposted as a ‘scenic drive’, which is precisely why I chose this route and makes it doubly annoying that I can’t use my camera. It’s easily the most technically demanding road I’ve been on so far, and I would need to be a much better rider to enjoy it at speed even if I’d come up on a sports bike, so I take it slow and enjoy the view, stopping frequently to snap pictures with my phone. There’s lots of cars parked up at various spots but not a lot of traffic on the road and I definitely feel like this was the better option, rather than sticking to the A82 up to Glen Coe; I’ve been up that road before and, while it’s nice, the view of Loch Lomond is largely blocked by trees and the traffic will most certainly be heavier. the entrance to Duke’s Pass. it says ‘Scenic Drive’, so go slow and enjoy the scenery! 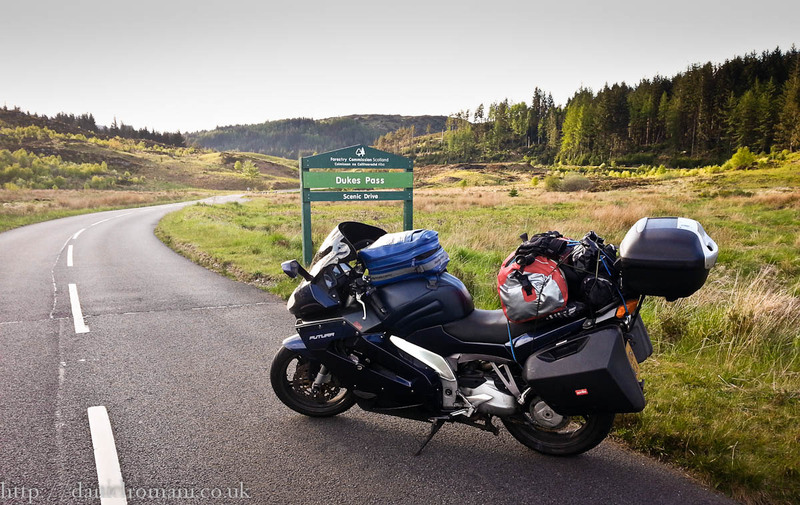 For a newbie, Duke’s pass is slow going but after you exit it, you turn onto the A84, then the A85, both of which are really great roads. Again, I’m loving the fact that I don’t have to worry about the road surface and I can just enjoy the corners. 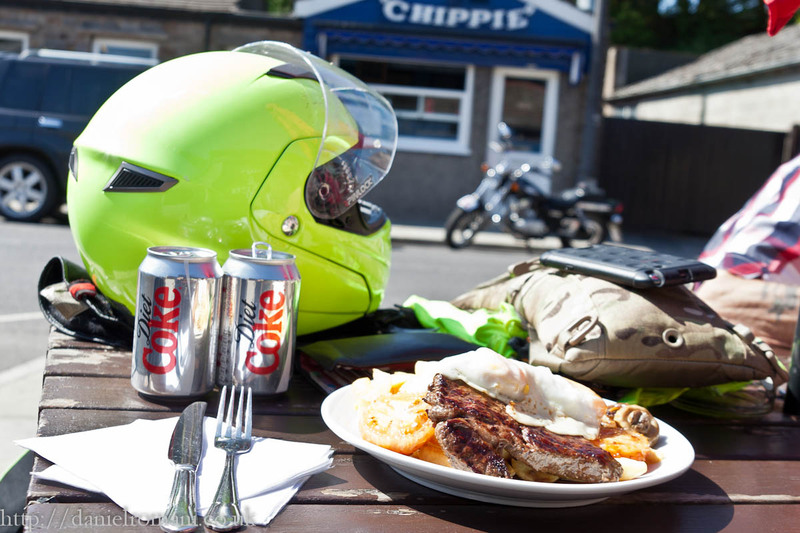 It’s hard enough riding an 1800+ mile trip when 90% of the roads are unfamiliar, I didn’t realise how much of a blight the poor surfaces in Southern England were until now, when I can finally relax! 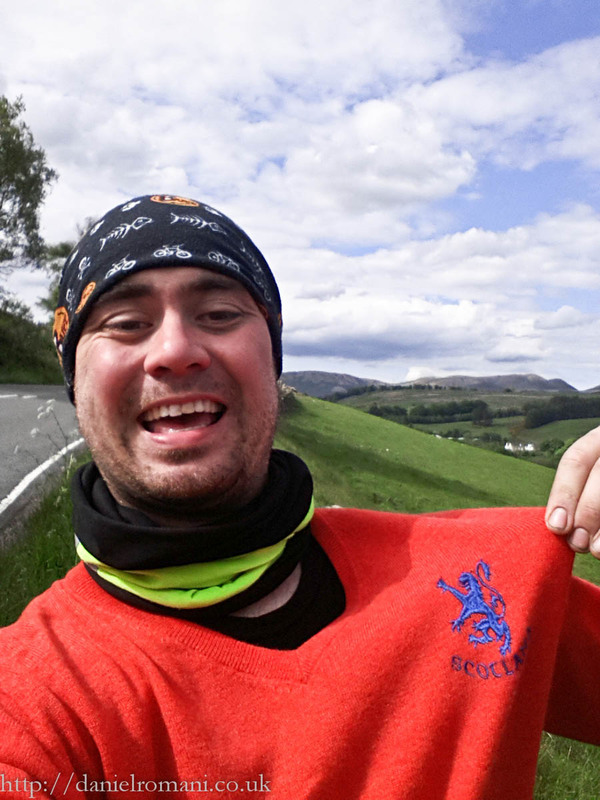 Seriously, Southerners, do yourself a favour and ride you bikes in Wales, Scotland, or maybe even France, but not England. Maybe by summer 2015 your roads will be ready! 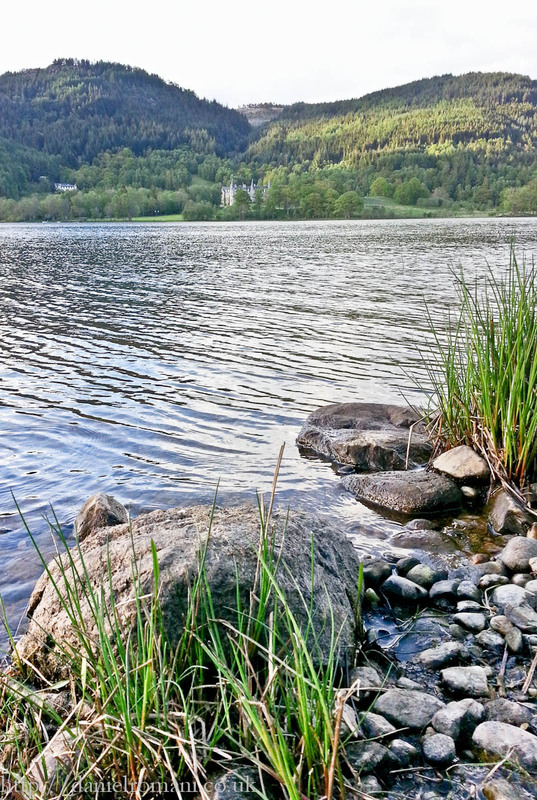 Fairytale Castle on the shores of a Loch. can’t believe I don’t have access to my camera! It’s late when I hit The Green Welly Stop. It’s just gone 9pm and I’m too late to try the Cullen Skink unfortunately! Instead I buy some more tinned Mackerel from the shop (mine is all locked away in the top-box) and press on toward Glen Coe. 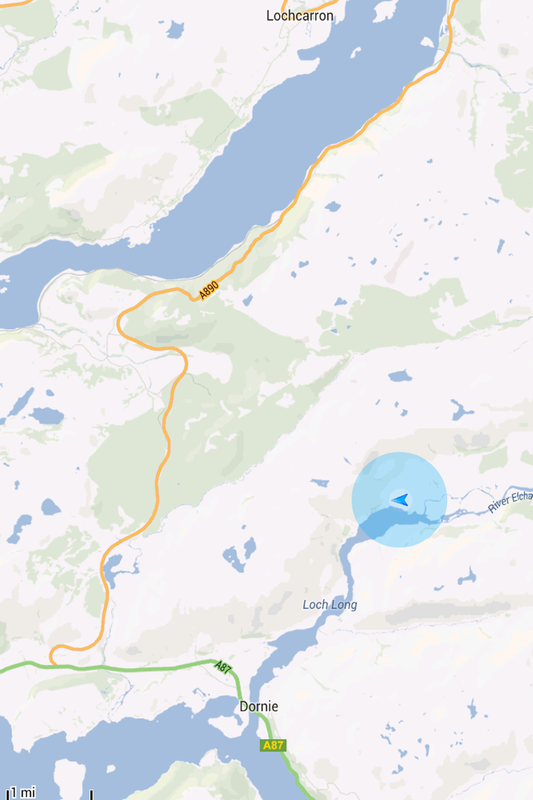 I’ve been a passenger in a car up the road between Glen Coe and Fort William (A87) and you can tell it’s a good road. I’ve visualised coming up on a bike; imagining where the braking and gear changes need to be made but nothing has prepared me for how outstanding this ride is. The Green Welly Stop – I’m too late for the fish soup! I know the light is fading but I can’t stop stopping to take pictures! Heading for Glen Coe, the skyline is beautifully ominous. The sun went down while I was still making my way North, so I don’t have to worry about it being in my eyes as I head West. It’s after the watershed on a Tuesday night and there’s not a soul on the road; no cars, no other bikers, no traffic police and, luckily, no deer. 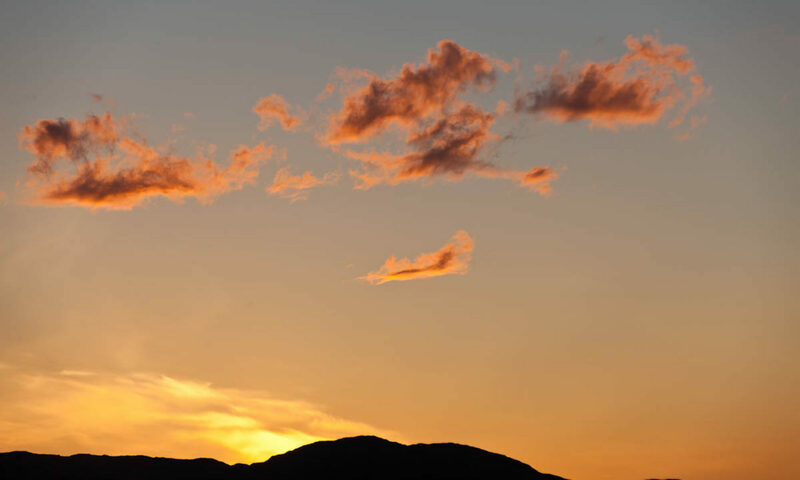 There’s a deep red glow behind the mountains on the horizon but the sky is still light and the view is incredible. 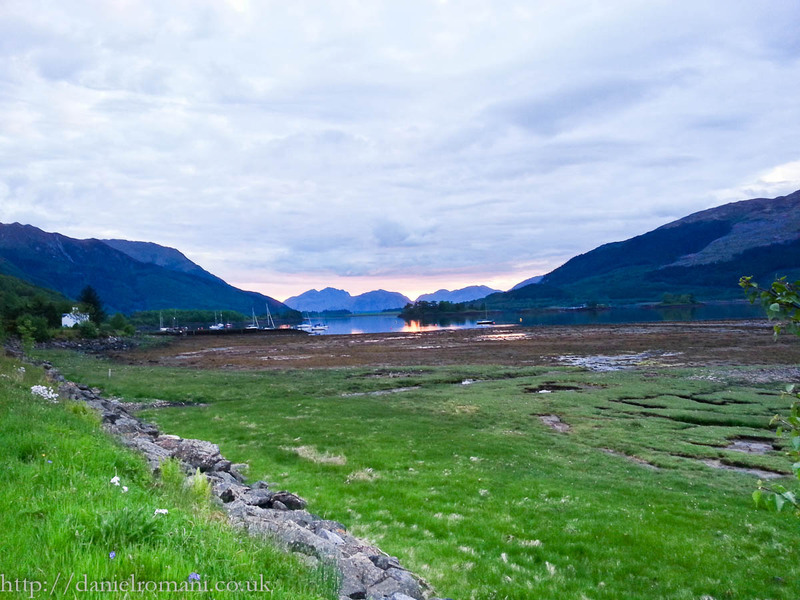 The A87 has something for everyone; long straights for the speed demons, sweeping curves for the novice rider and tighter but predictable curves for the more advanced rider; all of which is teamed up with darkly dramatic landscapes and syrupy smooth roads. I’m in heaven! In fact, I feel like I’m riding into heaven! All alone on this road I feel like a God, everyone should ride it. This is the kind of road I’d hoped for when I first departed. Snowdonia got close, much of the Welsh Leg is great riding but without the views, Alston is great but already too familiar to wow me; but right now, this road, with this scenery is the best thing that’s ever happened to me. It’s just made all the setbacks pale and the whole trip is validated. 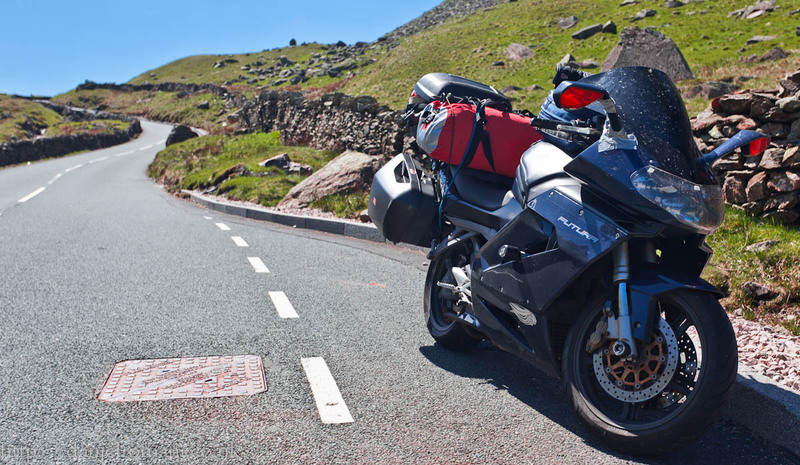 I can’t help but think how much more I’ll enjoy it when I come back with a sorted bike, not loaded with gear, running on 4 coils and with suspension that isn’t akin to a bouncy castle, and that thought makes my grin get even bigger. 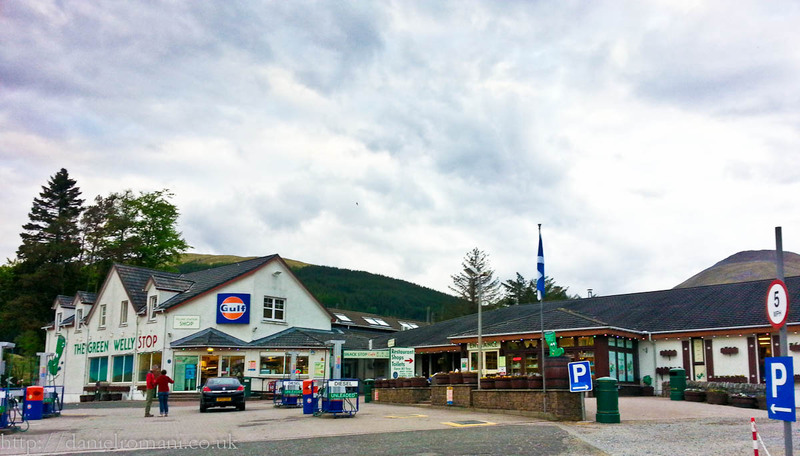 Alas, I’m having so much fun that, as I exit Fort William for more great riding, I pass the last Fuel Station I’m going to see for a while and I don’t realise that my reserves are running low again. 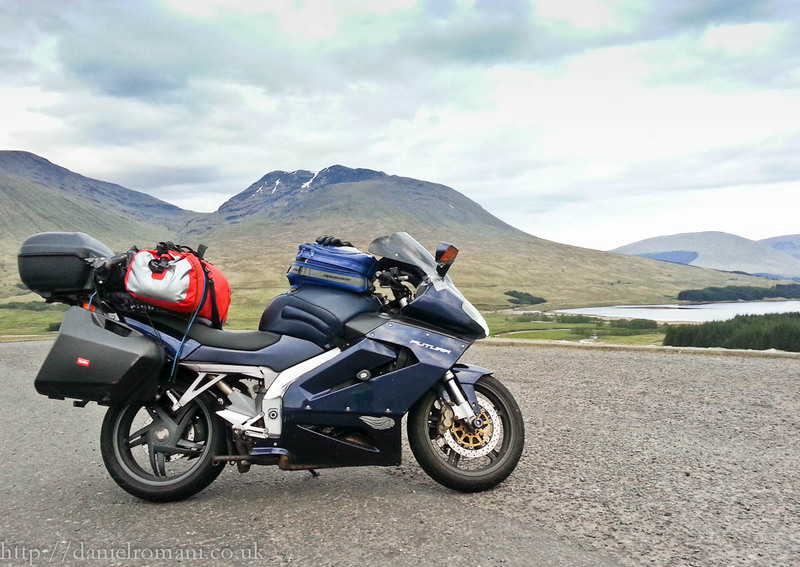 30 miles outside of Clunie, the low-fuel warning light comes on. I use the Sat-Nav to locate the nearest Petrol station and I’m relieved to see that there’s one in Clunie, I should be able to make it. It’s really late now though (although it doesn’t look it), and I’m wondering if it’ll be open. I call ahead to Mariella and learn that, if it’s not manned, I can ask in the pub and they’ll sort me out. It’s not to be, however, and 8.6 miles out (literally on top of Clunie Dam) the bike coughs and splutters to a halt. It’s getting dark now and the midgies are out in force still. As I wait for my friend to come recsue me, the bugs take their revenge for all of their fallen bretheren plastered to my helmet and headlights. Shortly after midnight, Mariella turns up with a jerry can of Unleaded and I follow her up to Sallachy (near Dornie) where a hot meal and a nice warm bed will be welcome after 15.5hrs in the saddle! Don’t worry though hammock campers, even though I’m staying here for some downtime tomorrow, I’ll be hanging my hammock the following night all the same! Sallachy, near Dornie and the Isle of Skye. This is where I’m spending the next few nights.